. . . we have some great news for those of you sending your kids through our unaccompanied minor program. 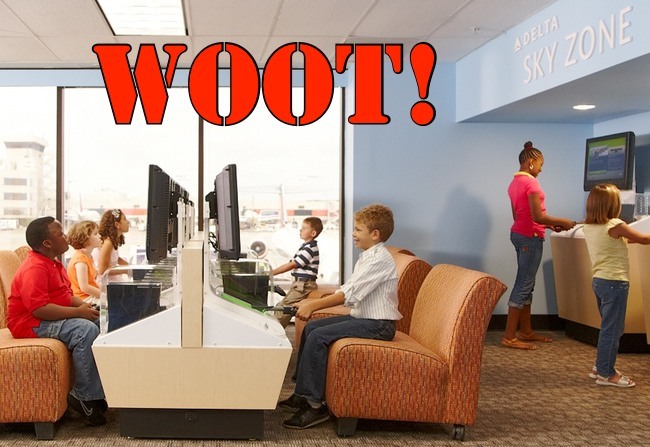 Now, when your kids connect through Atlanta they’ll enjoy our new Delta Sky Zones on Concourses B, C and E! Delta does not tell us if we can send our kids there, even if they’re accompanied by us. They also don’t mention if these Sky Zones will be close to Sky Clubs. Layovers with kids would be MUCH easier if the kids could go hang out in the Sky Zone while the parents lounged in the Sky Club. Furthermore, I bet most of the other Sky Club guests would be happy to have less kids in there!